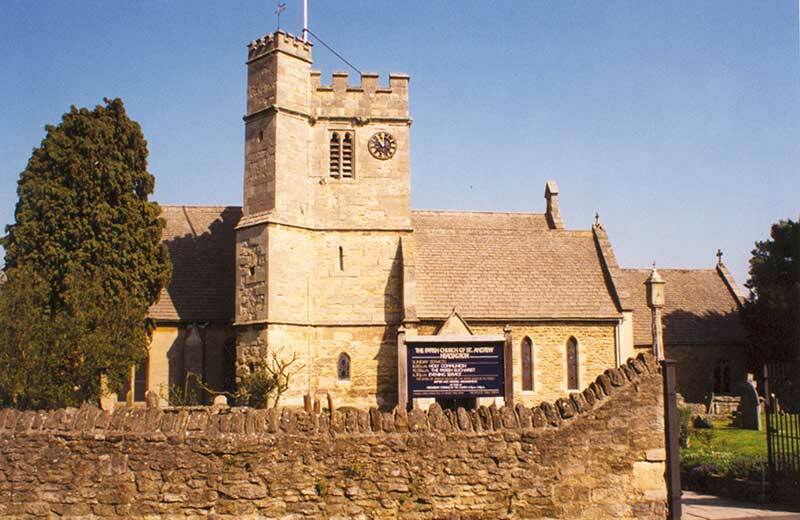 St Andrew’s Church is Headington’s oldest surviving building. Some parts of it date from the twelfth century, and it is thought to have been established by Hugh de Pluggenait, who was Lord of the Manor of Headingon from1142 to 1201; but there was probably already a small Saxon building on this site. 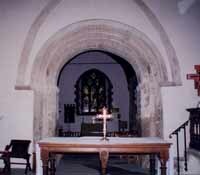 The arch (left) and part of the chancel are the oldest remaining parts, dating from Norman times. The windows in the north and south walls of the chancel date from the fourteenth century; and the oldest of the bells, dating from the mid-fifteenth century, bears the inscription “Sancta Margareta Ora Pro Nobis”. The present tower was not completed until c.1500, and the south porch was added in 1598.
incumbered with galleries and pews, woodwork of different ages and every imaginable shape, position and proportion, the floor well below that of the churchyard, broken and uneven. The roof admits an abundant supply of rain. 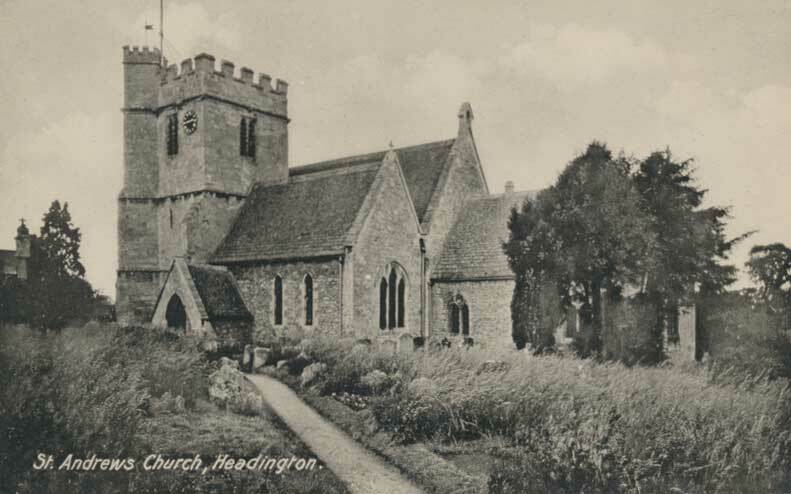 Some repairs were undertaken that year, but despite the opening of Holy Trinity Church in Headington Quarry in 1849, St Andrew's was not large enough to cope with the expansion of Old Headington and the development of New Headington village. HAVING become dilapidated and insufficient for the accommodation of the Parish, it was determined in the year 1862, with the hearty concurrence of the Diocesan, to attempt its repair and enlargement. 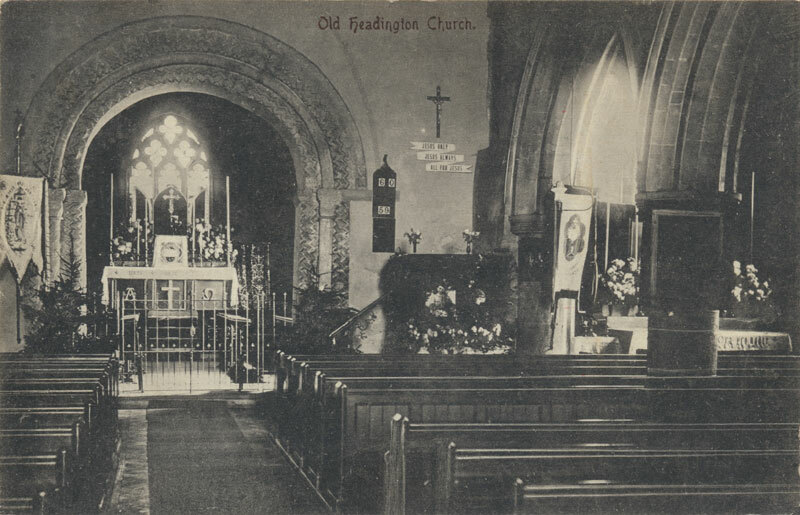 It was accordingly surveyed by Mr. J. C. Buckler, who reported that it was almost ruinous, and by him Plans were prepared, by which all the important architectural features of the old Church were preserved, and 320 additional free sittings obtained. Thus accommodation would be afforded for about 600, the population of the Village being about 1700. The proposed Plan embraces an outlay of something like £3000. To meet this, Subscriptions have been received from the Parishioners and Friends to the amount of £1100. The Oxford Diocesan Church Building Society has promised a grant of £200, and the Church Building Society a sum of £160, but these are only payable on the completion of the work. Of this one section has been executed, by which about the same accommodation as previously existed is now furnished. The funds collected fall considerably short of the amount required, and, unless further aid be given, the work must stop, and the additional accommodation so much needed by renounced. To bring this great need under the attention of the public is the object of the present notice. It is most desirable that the work should be finished as early as possible. The population, chiefly agricultural, is rapidly increasing, a circumstance proved by the proximity of Oxford and by the facility with which sites for building cottages can be obtained. The efficient aid of the public is therefore earnestly solicited. Any information may be obtained from the Vicar, the Rev. J. C. Pring; the late Curate, Professor Rogers, Oxford; of the Churchwardens, Messrs. Gill and Knowles, by whom subscriptions will be received thankfully; or by either of the Oxford Banks. 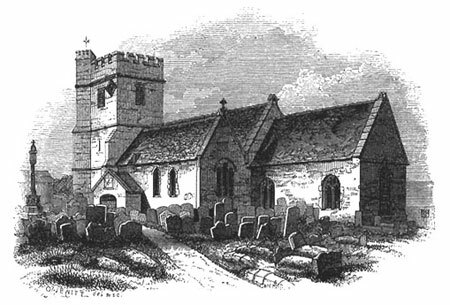 In 1880 William Wilkinson designed a new aisle and vestry on the north side of the church, and it was proposed to re-seat the church with open pews. T K: C. R C: W. 1679. A great Part of the Church Yard of Heddington, viz. on the West, North and East sides, is turned to a prophane Use, & separated from the other Part of the Church Yard by a Wall, as if it did not at all belong to it. This is a Matter of Scandal & ought to be rectifyed by the Care of the Bp. I am apt to think that this Prophanation of the Church Yard began in the late Oliverian Times. WHO TO THE KING DID BELONG. I made some Inquiry about a farther Account concerning the said John Young. But not meeting with any of the Seniors of the Place, I could not be satisfied. For which reason, I must remember to make farther Inquiry hereafter. This precedes the earliest surviving burial register of St Andrew’s by twenty years.